· This year’s Shri Amarnathji Yatra will commence on 2nd July, 2015, via both the routes Baltal and Pahalgram, and conclude on 29th August, 2015. · Registration is necessary for the Yatri. · Nobody, shall be allowed to undertake the Yatra without Yatra Permit which is valid for the day and route in question. · A Yatri can secure his / her Yatra Permit via selected bank branches (87 of J&K Bank, 305 Punjab National Bank and 38 of YES Bank) located in various States / UTs. · The Registration for the Yatra 2015, via selected Bank Branches, has commenced from 01st March, 2015. · For Registration / obtaining a Yatra Permit through a designated Bank, an intending Yatri shall have to submit filled-in prescribed Application Form and Compulsory Health Certificate issued by the Authorised Doctor / Reputed Private Medical Institution. · For Yatra 2015, Compulsory Health Certificate issued only after 10th February, 2015, would be valid for the registration purposes. · An intending Yatri will be required to pay Rs.50/- as Registration fee, for registration through a designated Bank. · A Yatri who travels by Helicopter will not be required to separately register for the Yatra. · A Yatri who travels by Helicopter will, however, be required to submit the prescribed Compulsory Health Certificate at the time of boarding the Helicopter. · A Yatri should embark on his / her Yatra only on the day and from the route for which he / she is registered. 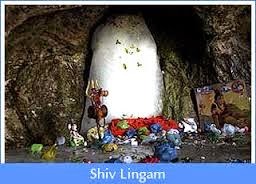 · Please visit Board’s website: www.shriamarnathjishrine.com to know how an ex-India pilgrim can register himself / herself for the Yatra. · A group of five or more Yatris can also register themselves through the Group Registration Facility. · Please visit Board’s website: www.shriamarnathjishrine.com to know how to register through Group Registration Facility. The Union Ministry of Home Affairs has also reviewed mobile/telecom connectivity for the upcoming Amarnathji Yatra 2015 and the Ministry is taking necessary steps to ensure better connectivity this year. BSNL is also working on augmentation of VSAT capacity and increase in bandwidth. BSNL will also enhance number of Base Transceiver Stations and their configuration to take care of congestion where pilgrims will be halting for night stay/en-route. Shri Amarnathji Shrine Board has identified Camps located at the Holy Cave, Panjtarni, Sheshnag and Sangam as the Camps where Satellite Phones and VASAT connecitivty is crucial for the conduct and regulation of the Yatra. 1) Do carry sufficient woolen clothing as the temperature can sometimes abruptly fall to below 5 degree Celsius. 2) Do carry umbrella, wind shetter, raincoat, and waterproof shoes as the weather in the Yatra area is unpredictable. 3) Do keep your clothes and eatables in a suitable water proof bag to avoid your belongings getting wet. 4) Do keep in your pocket a note containing the name / address, mobile telephone number of any Yatri proceeding for Darshan on the same date as you are doing, for emergency purposes. 5) Do carry your identity card / driving license and Yatra Permit with you. 6) Do travel in a group along with porters / horses / ponies carrying your luggage. 7) Do ensure that all those comprising the group remain in your sight, lest you are separated from your group. 8) On your journey home, you must leave the Base Camps along with all other members of your group. 9) Do seek immediate assistance of the Police in case any member of your group is missing. Also have an announcement made on the Public Address System at the Yatra Camp. 10) Do help your fellow Yatris travelling with you and perform Yatra with a pious mind. 11) Do strictly follow the instructions issued by the Yatra Administration from time to time. 12) Earth, water, air, fire and sky are integral parts of Lord Shiva. Therefore do respect the environment and do nothing whatsoever to pollute the Yatra area. 1) Ladies must not wear saree while trekking during the Yatra. Salwar kameez, pant-shirt or a track suit will be more comfortable for them. 2) Ladies who are more than 6 weeks pregnant shall not be allowed to undertake the pilgrimage. 3) Children below 13 years in age and elderly persons above the age of 75 years shall not be permitted to undertake the pilgrimage. 4) Don’t stop at places which are marked by warning notices. 5) Don’t use slippers because there are steep rises and falls on the route to the Holy Cave. Only wear trekking shoes with laces. 6) Don’t attempt any short cuts on the route as doing so would be dangerous. 7) Don’t commence journey on an empty stomach (fasting). If you do so, you would be prone to attracting serious medical problems. 8) Don’t do anything during the entire Yatra which could cause pollution. 9) Don’t use polythene as its use is banned in J&K and is punishable under law. 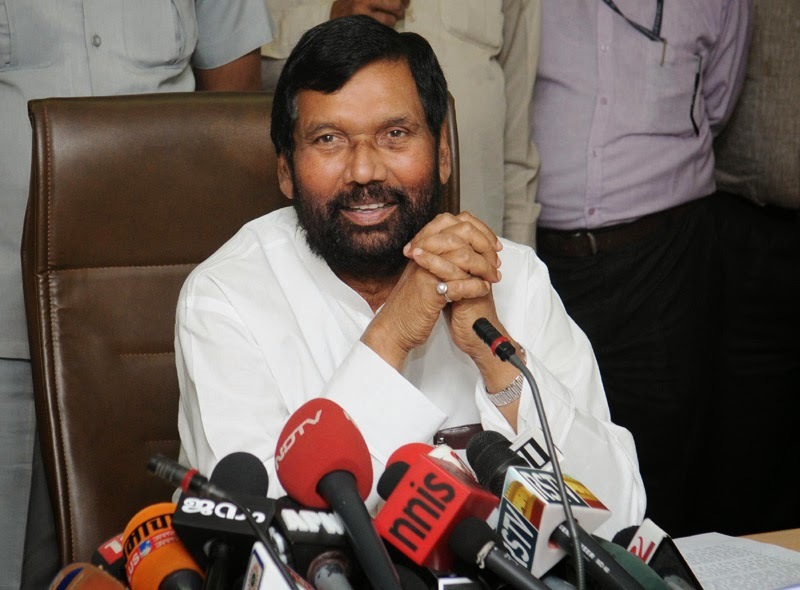 The Union Minister for Consumer Affairs, Food and Public Distribution, Shri Ram Vilas Paswan addressing a press conference after discussion on the issue of pending sugarcane arrear with the Ministers of major sugarcane growing states, in New Delhi on April 16, 2015. The Centre Government today held a meeting with the State Governments to discuss the issue of pending sugarcane arrears. The meeting chaired by Shri Ram Vilas Paswan, Ministry of Consumer Affairs, Food and Public Distribution was attended by Ministers incharge of the sector from State Governments and Senior officials of the Centre and State Governments. Shri Radha Mohan Singh, Union Minister of Agriculture, Dr. Sanjeev Balyan, MOS Agriculture and Smt. Maneka Sanjay Gandhi, Minister for Women and Child Development also participated in the meeting. Expressing concern over pending sugarcane arrears, Shri Ram Vilas Paswan said all possible efforts must be made to facilitate payment of the arrears by the State Governments. He said that the Centre is conscious also of financially problems of the sugar industry, hence already taken number of initiatives to help the industry and to facilitate payment of arrears. He urged the State Governments to take all possible initiatives at their end also for this purpose. - The Centre should create a buffer stock of sugar . - Loan should be made available from Sugar Development fund (SDF) for ethanol production, Modernization of mills and co-generation. - Exemption should be given to produce ethanol directly from Molasses. - Import of sugar should be totally banned and import duty should be increased from 25%-40% immediately for this purpose. - Export subsidy should also be provided for the export of white sugar. - Subsidy or financial assistance from the centre to facilities payment of the arrears should be transferred directly to the sugarcane farmers. - Interest free loan being provided to the sugar sector should be restructured. Shri Paswan said the Government will take up this suggestion with concern Ministries and take a final view in the interest of farmers and industries both. Shri Paswan also had day long meeting with representatives of farmers yesterday to discuss the issue and to seek their suggestion. It was attended by 24 organizations from all over the country. 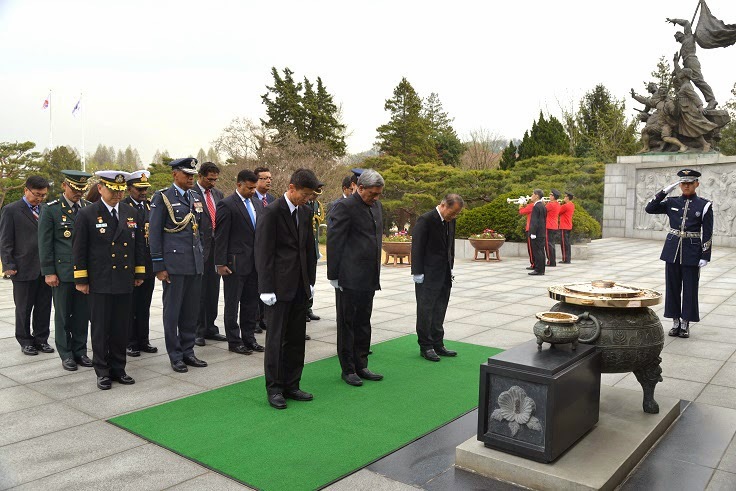 Today, on the first day of his official visit to Seoul, Defence Minister Shri Manohar Parrikar began the day at a solemn ceremony to pay homage to martyrs of Korea’s independence movement and the Korean War at the National Cemetery. He also recalled the role of the Indian Army in providing medical assistance and repatriation of prisoners during the War. Later in the day, Defence Minister visited Korea’s ninth largest corporation, Hanwha. In its 63 year history, this firm has become a Korean leader in ordnance, fuzes, precision guided systems, sensors and aerospace. In the detailed site visit facilitated by Hanwha President Shim, RM invited Hanwha to participate in the Make in India programme, taking into account the enormous opportunities for mutually beneficial business. Later in the evening, in Seoul, Shri Manohar Parrikar addressed an India-Korea Defence Industry Forum arranged by the Embassy in association with the Indian Chamber of Commerce in Korea (ICCK). Senior representatives of 10 Indian defence firms interacted with senior representatives of the Korean Defence Acquisition and Program Administration (DAPA), Korean Defence Industries Association, and over 15 leading Korean defence industries. Defence Minister highlighted that the defence industry in India would be likely to see $250 bn worth of business over the next decade as India modernized its defence systems and industries. After outlining the policy changes being brought forward by the Government of Prime Minister Modi to facilitate investment in the defence sector, Shri Manohar Parrikar said that the time had come for Korean defence firms to take advantage of the high brand value enjoyed by Korean-made produts in India, and to enter the defence market as partners for the long-term. In the presentations, it was also noted that the ongoing internal process of further streamlining India’s defence procurement policies would be completed in less than three months. After presentations by Defence Minister and his delegation, detailed presentations were made regarding business opportunities for Korean defence firms by senior management of Indian defence firms including Goa Shipyards Ltd., Bharat Electronics Ltd., Mahindra Defence, L&T Ltd. and Tata Power SED. Finally, Shri Parrikar met the top management of Hyundai Heavy Industries and invited them to become strategic partners for India’s defence and commercial shipping sectors. On 17 April, Shri Manohar Parrikar will co-chair the India-RoK Defence Ministerial meeting with his Korean counterpart, Gen. Han Min-Koo. Defence Minister will also meet the RoK Chairman of the Joint Chiefs of Staff, the Minister of DAPA and the NSA of the RoK, Gen Kim Kwan-Jin. The Defence Minister of India (RM) Shri Manohar Parrikar arrived in Seoul today on his first official visit to South Korea. The Minister is accompanied by the Defence Secretary and senior Indian military and civilian officials from the Ministry of Defence and an Indian Defence industry delegation. During this three-day visit to RoK, RM will co-chair the India-RoK Defence Ministerial meeting with his Korean counterpart Gen. Han Min-Koo on 17 April. They will hold extensive discussions on the entire gamut of the bilateral defence relationship and regional and global issues of mutual interest, and will in particular identify ways to upgrade the Defence relationship. RM will also meet the Chairman of the Joint Chiefs of Staff, Admiral Choi Yun-hee, Minister Chang Myoung-Jin of the Korean Defence Acquisition Program Administration and National Security Adviser, Kim Kwan-Jin. 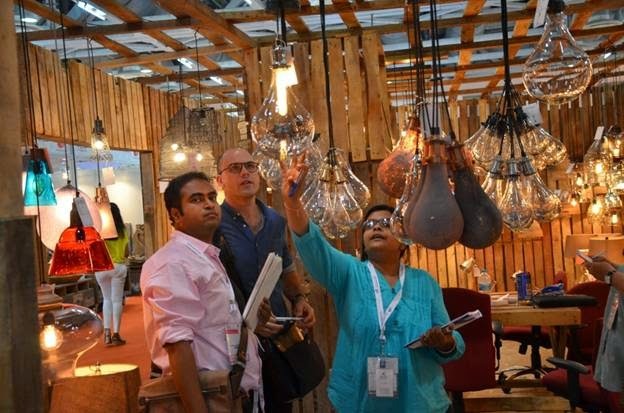 Home Expo India 2015,, the 4th edition of the three-in-one exhibition comprising IFFTEX (Indian Furnishings, Floorings and Textiles Show), IFAS (Indian Furniture and Accessories Show) and IHDS (Indian Houseware and Decoratives Show), opened at India Expo Centre and Mart, Greater Noidatoday. There has been an overwhelming response from overseas buyers, with 600 overseas buyers participating. 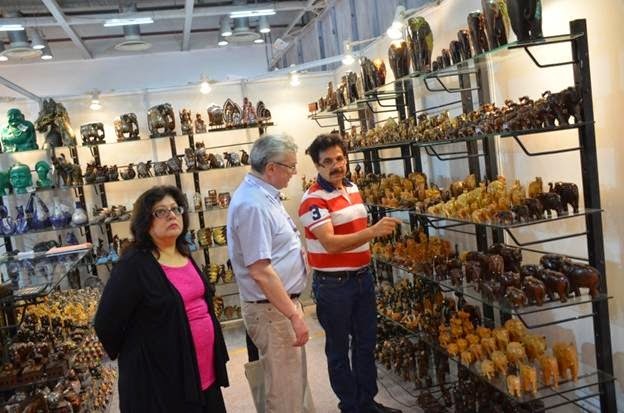 Organized by Export Promotion Council for Handicrafts (EPCH),, the nodal export promotion body for handicrafts in India, the show addresses the industry demand for sector-specific shows that better cater to the specific requirements of buyers. The show is in line with this international trend and is highly appreciated by international visitors. 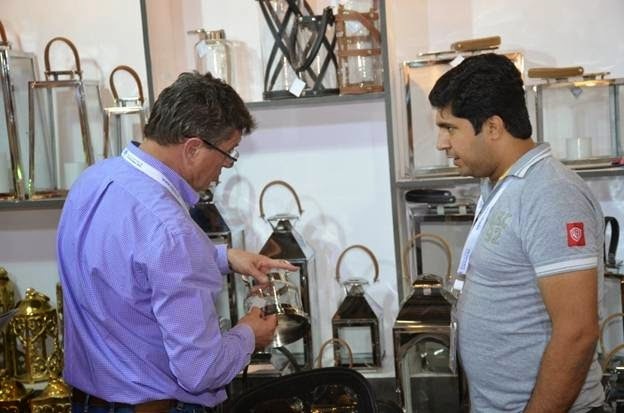 Buyers are able to concentrate on products they need, without getting lost in the multitude of products and services which are part of bigger multi-sector exhibitions. About 500 companies (including permanent mart owners) are exhibiting their collectionsat the India Expo Centre and Mart. 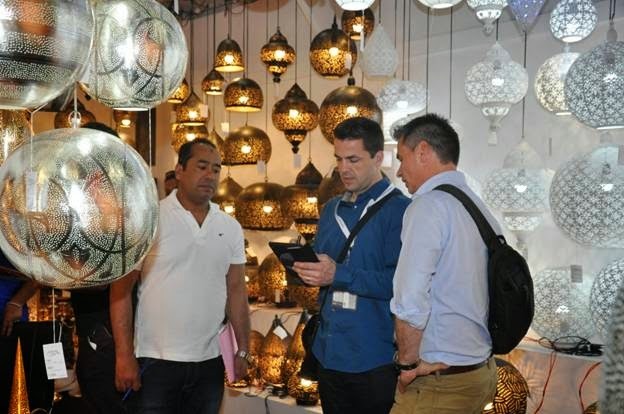 Home Expo India covers sectors with maximum thrust and growth potential for Indian handicraft exporters who present a wide range of colourful handicraft items in home décor, furnishing, furniture, flooring, and textiles. Minister of State for Textiles (I/C), Shri Santosh Kumar Gangwar, laid the foundation stone for an Apparel & Garment Making Centre at Pasighat, Arunachal Pradesh today, in the presence of Minister of State for Home Affairs, Shri Kiren Rijiju and Minister of Textile & Handicrafts of Arunachal Pradesh, Shri Tapang Taloh. The Centre is being set up as part of a landmark initiative announced by the Honourable Prime Minister Shri Narendra Modi in Nagaland, on 1st December, 2014. The Prime Minister had announced that an Apparel and Garment Making Centre shall be constructed in all North Eastern states. 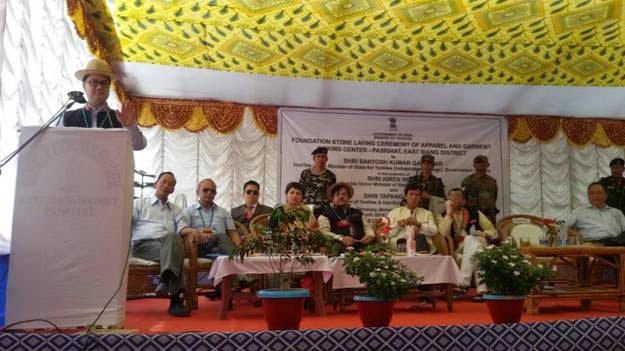 Work on such a Centre for Nagaland has already begun, after the foundation stone was laid by the Union Textiles Minister, on 24th February, 2015. 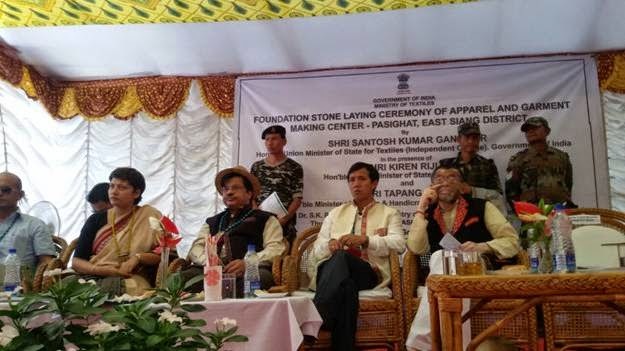 Shri Gangwar laid the foundation stone for an Apparel and Garment Making Centre in Manipur on 24th March, 2015 and in Sikkim on 25th March, 2015. Each Apparel and Garment Making Centre set up under the initiative is estimated to generate direct employment for 1,200 people. Each state will have one centre with three units, each having 100 machines. For local entrepreneurs with requisite background, required facilities to start a unit will be provided in ‘plug and play’ mode. Once such entrepreneurs get established, they can set up their own units, allowing the facility to be provided to new entrepreneurs.